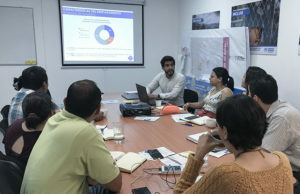 During our latest mission to support profiling partners in Honduras to jointly analyse the preliminary findings, we had the opportunity to speak with Manuel Moncada, technical assistant on internal displacement at the San Pedro Sula municipality. We asked him about how the municipality is working to respond to internal displacement and how the past and current profiling exercises have been useful in doing so. In fact, municipalities have a critical role to play in designing more effective responses to urban displacement, as they often serve as first points of contact between IDPs and government institutions providing protection, relief and assistance. This line of thinking is highlighted by global initiatives looking to localise humanitarian assistance in displacement contexts through greater cooperation among international and municipal actors. It is also emphasised in the recent publications on urban displacement produced through the Global Alliance for Urban Crises. As JIPS’ experience in various displacement contexts has shown, data can be a powerful tool to foster this collaboration: building a shared understanding of the situation with an evidence base that all partners agree on, can inform responses at national and local level that are not only complementary but also better tailored to each context. At a session we facilitated with members of San Pedro Sula’s municipal administration, we discussed how the upcoming results of the national exercise could benefit their local responses and planning processes. During the workshop with representatives from the Municipality of San Pedro Sula, Honduras, we jointly discussed the preliminary findings and analysis. Since 2013, when internal displacement due to violence was formally recognised by the Honduran Government and the Inter-institutional Commission for the Protection of Populations Displaced by Violence (CIPPDV, in Spanish) was established, efforts have been taken in the country, both at the national and local level to address the issue. At national level, these include an ongoing profiling exercise led by the CIPPDV with technical support from JIPS and UNHCR. Building on an earlier exercise implemented in 2014-2015 (see profiling report), it aims to provide nationally representative and agreed-upon information to support the country’s legislative framework and inform prevention, protection, and assistance efforts as well as the search for durable solutions. At local level, some of the municipalities with the highest concentration of displaced households (see findings from the profiling exercise in 2014-2015) are leading their own responses to address the phenomenon. One of these municipalities is San Pedro Sula, Honduras’ second largest city. Though the Municipality of San Pedro Sula has not been directly involved in the exercise mentioned above, it is part of the wider network of actors who, through the CIPPDV, were consulted and participated in workshops at different stages of the process, contributing their local perspective at different stages. The municipality’s response to internal displacement started out in 2017, with a campaign to raise awareness, mainly through sessions with the directors of the gerencias (the highest administrative division in the municipality) as well as field staff. Building on the 2014-15 profiling, their aim was to foster a better understanding of the phenomenon and the differences between displacement and economic migration or migration to reunite with family. Later sessions also looked at the Guiding Principles on Internal Displacement and the Comprehensive Regional Protection and Solutions Framework (MIRPS, in its Spanish acronym). In 2018, with support from UNHCR and the Norwegian Refugee Council (NRC), the municipality then drew up an initial displacement response plan. This plan is coordinated by a municipal committee made up of five of the city’s gerencias, namely those working on the Delivery of Social Services; Prevention, Security and Urban Mobility; Health; Competitiveness; and Public Services and Community Engagement. The plan covers four key areas, including the design of a statistical tool to measure displacement within the municipality. In addition, the Municipality of San Pedro Sula has also conducted a baseline study building on a secondary data review, as well as key informant interviews and focus group discussions. This helped to better understand the specific causes and triggers of internal displacement in the municipality, including identifying districts and communities that were especially affected by the issue. The study, which will be launched soon, aims to inform the city’s long-term development planning. This (baseline study) makes San Pedro Sula ‘a pioneer’ among Honduran cities and demonstrates its strong political will and openness (to address violence-induced internal displacement). 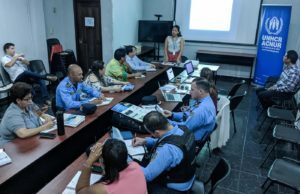 JIPS’ team members, Andrés Lizcano Rodriguéz and Melissa Weihmayer, discussing preliminary findings with members of the San Pedro Sula Protection Working Group (March 2019). Moving forward, Manuel Moncada emphasises it will be particularly important to preserve the momentum and institutional will that led San Pedro Sula to invest its energies and resources in responding to displacement. In 2019, he explains, the municipality will focus on the implementation of the humanitarian assistance mechanism. Resources have already been secured for a pilot with a group of 50 families – about 250 people. Talking about displacement with high-risk communities requires strategy and tact. You can endanger educators or community leaders by merely speaking about it. The subject is sensitive. Developing strategies to build durable solutions for IDPs, learning from past experiences where efforts to generate income for affected communities through means like entrepreneurship schemes were hindered by widespread extortion by criminal groups. Continuing to raise awareness among local officials and to accompany them to enhance their commitment and sensitivity to the subject of violence-induced internal displacement and building relevant capacity. Enhancing coordination with other organisations, including sharing responsibilities and bringing together their diverse expertise, which is instrumental in establishing and implementing the city’s contingency plan. Developing a strategy to better involve communities in the design of policies and implementation of interventions. This will also require building trust and finding ways to approach communities who may rather want to stay anonymous so to avoid any risk of violence. Though he says these challenges require local responses first, Manuel Moncada looks forward to exploring the upcoming results of the ongoing profiling exercise, which come at a relevant time for the municipality. For JIPS, the example of the Municipality of San Pedro Sula well demonstrates the importance of disseminating profiling results not only at national and international levels, but also among local stakeholders. Efforts undertaken in San Pedro Sula could be an opportunity for widening the evidence base on internal displacement in Honduras for local responses. Did you find this article interesting and would like us to share more such stories? Drop us a note at info@jips.org.